WARNING: This post contains SPOILERS for Doctor Strange. Let’s be honest: Doctor Strange had a lot to live up to, and more than for just being the first new property to debut in the Marvel Cinematic Universe’s Phase III. Its absolutely stellar cast (one of the reasons why Marvel Studios, the film arm, was purported to break away from the overarching Marvel Entertainment), its way-out-there visuals, its mystical subject matter – all combine to make not only a departure for the shared universe, but one of the company’s biggest gambles yet. The good news is that the risk more than paid off, providing one of the strongest installments yet in the MCU (and considering that this is the 14th entry, that’s no small compliment). We’ll still have to wait and see if the box office take will back up this creative success, but that can’t stop us from saluting what writer-director Scott Derrickson and his collaborators have managed to accomplish now. Here, then, are the 15 Best Scenes in Doctor Strange. In the movie’s mid-credits scene, we see Doctor Strange (Benedict Cumberbatch) talking to someone off-screen in the New York Sanctum Sanctorum, offering him something to drink while preparing to talk about what will apparently be some serious business. The first payoff of this scene is the revelation of Strange’s conversation partner: Thor (Chris Hemsworth), the god of thunder himself, which leads to a fun little gag about Thor continuing to drink while the future Sorcerer Supreme continues to magically fill the glass up again. But neither moment compares to the real thrust of the scene: that Thor and his mischievous brother, Loki (Tom Hiddleston), are on Earth, looking for their missing father, Odin (Anthony Hopkins). This not only serves as a flash-forward sneak peek at Thor: Ragnorak, which is due to arrive almost exactly a year from today (something Marvel first attempted with Ant-Man’s jump-forward to Captain America: Civil War last year), but it’s also part answer to a question that has been plaguing fans ever since the end of 2013’s Thor: The Dark World: just what happened to King Odin? While we still don’t have any definitive answers, at least we now know that the Allfather is still alive, and that’s certainly something. The traumatic event that kicks Dr. Stephen Strange’s character arc – and metaphysical journey – into action, the car crash has several different elements going for it. First, there is the shock of the incident – the sudden onslaught of the accident, the swerving across the road, the flipping through the air, and the smashing down into the water. All of which underscores the sheer technical mastery behind the sequence, from the on-location shooting to the CG rendering (when reviewers say that audiences must see this film in 3D, this is one of the big contenders why). And then there’s the little blink-and-you-miss-it nugget that serves as the first of only two references Doctor Strange makes to the greater Marvel Cinematic Universe (not including the after-credits scenes): over the phone, the good doctor is offered a new case to work on involving an Air Force colonel who has severe spinal damage due to an accident in an armored suit – War Machine’s (Don Cheadle) injury suffered at the hands of the Vision (Paul Bettany). It’s great to see the events of Civil War get mentioned, even if fleetingly. One of the film’s tragically-underused characters is Dr. Christine Palmer, better known as Night Nurse in the comics (not to be confused with that other Night Nurse, Claire Temple [Rosario Dawson], in the Defenders Netflix series), which both deprives Doctor Strange of some extra heart and continues to perpetuate what has been dubbed the “girlfriend problem” in the MCU. Christine shines brightest when she responds to Strange, her ex-lover, after he comes careening back into the hospital, decked out in his new “cult” outfit, spouting mystical mumbo-jumbo, and brandishing a wound that seems to have been impossibly inflicted. The capstone would at first seem to be her witnessing of a portal in the broom closet that allows Stephen to jump back to the New York Sanctum (who would have thought that a falling mop could be so humorous? ), but it’s overshadowed shortly afterward by Strange’s return visit. “Are you serious?” Christine exclaims upon hearing the telltale signs of the portal re-opening – until she sees an injured Ancient One (Tilda Swinton), which stops her dead in her tracks. Funny and sad – Marvel’s specialty. 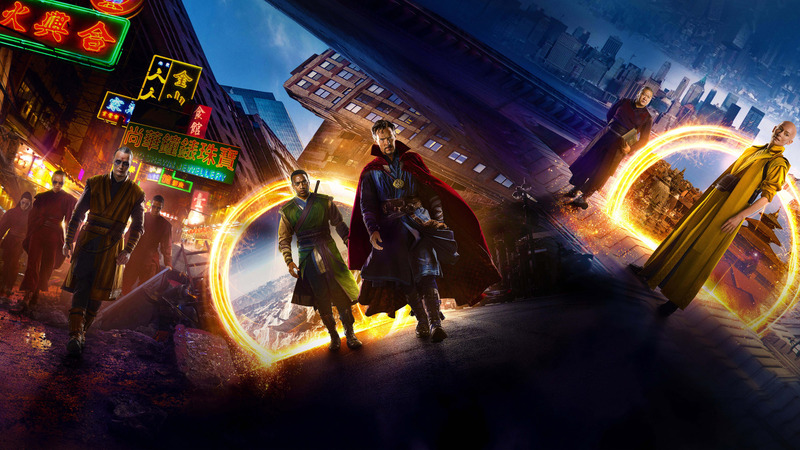 Stephen Strange and Karl Mordo (Chiwetel Ejiofor) are battling against Kaecilius (Mads Mikkelsen) and his disciples in the mirror dimension, and the sequence employs the movie’s by-this-point-well-entrenched Inception-esque landscape-shifting technique. Although never short of being visually arresting and technically impressive, this stylistic approach to wizarding battles has, by this point in Doctor Strange’s runtime, become normalized and internalized by the audience; it’s become just another chase scene. And then the Ancient One shows up, upsetting the balance of the fight and changing the direction (literally) of the scene, just as Stephen is at the mercy of Kaecilius and is about to be slain. It is here that the movie begins to one-up itself, having Mordo realize that his master has, indeed, been drawing power from the Dark Dimension – and then everything turns south again when the Ancient One herself ends up taking Strange’s place as the zealots’ murder victim. The conjuring of that last portal, and how the protagonists pathetically flee from the might of their enemies, is an enduring image. The scene’s more than just a humorous gag, however. Doctor Strange moves quickly without quite feeling rushed, and such economics in storytelling are perhaps most perfectly on display here; audiences get to see how much of the Magical Arts Strange has learned since just the previous sequence while also demonstrating the character’s affinity for breaking rules, something which will ultimately prove to be to all of their benefits by the movie’s end. For a film with so much emphasis placed upon action or mind-bending visuals (or, usually, both at the same time), Strange still manages to find some time for the quiet moments, as well. The biggest – and the most poignant – of these is easily the goodbye scene between Stephen Strange and the Ancient One, when his astral form chases hers out of the operating room and unto a balcony, overlooking New York and the water. Visually, the moment is effective, given that the two are in the process of stretching one moment into “a thousand,” which the bolt of lightning that is forming in the clouds overhead and preparing to strike the ground below attests to. But the real punch here, actually, is in how Scott Derrickson handles their final moment together. Whereas other movies would (and often do) have it be a histrionic farewell, all tears and desperate hugs and overwrought music, here it is a simple, sweet holding of the hands, and then nothing – the Ancient One just disappears when she passes over to the Other Side. The fact that, even here, the filmmakers opted to forego any cliché visual representations of death (such as vortexes of bright lights or the slipping through dramatic doorways) makes the sequence all the more impressive – and memorable. The fight between the astral representations of Dr. Strange and Lucian (Scott Adkins), one of Kaecilius’s most fervent zealots, around the former’s dying body while Christine Palmer attempts to work it over is one of the standout moments from the movie, taking full advantage of its various mystical elements (astral projection is good for action as well as exposition and heartfelt drama) and helping Strange to stand out from the rest of the comic-book adaptation crowd, as well. Of course, the little bits of humor thrown in – lights that get shorted out, or objects that get disheveled in the spirits’ fisticuffs – only help to underscore the sequence’s uniqueness. And let’s not forget its climax, when Christine pumps Strange’s body full of enough electrical current to disintegrate Lucian’s astral form and, even, to burn his physical body, all the way back in the New York Sanctum Sanctorum. It’s the perfect ending. The unsung hero of the movie is, without question, the Cloak of Levitation – a pretty remarkable comment, considering that it (a) is a piece of fabric and (b) is entirely CG-rendered. When the cloak is broken free from its display case and immediately shrouds the good doctor, it begins working in his best interests, punching his adversaries, helping him fly above the fray, and tugging him out of harm’s way. But what probably ends up being the Cloak of Levitation’s most effective moment is when it snaps off of Strange’s shoulders and wraps itself around Lucian’s head, temporarily blinding him – and then slamming his head into the floor again and again, its own limited-but-cute way of helping to thwart the bad guys and allowing the good doctor to escape. Here’s the Cloak of Levitation again, stealing yet another scene. As Strange’s fight with Kaecilius continues, the former’s cape pulls him back to the other side of the room in the New York Sanctum. Stephen thinks it’s to grab an axe, which he repeatedly attempts to do, while the cloak continues to hold him back, humorously keeping him in place while the amused villain calmly collects himself and readies to strike again. Strange eventually discovers what the magical object wants out of him, and he grabs some sort of medieval-looking contraption – which proceeds to unfold and wrap itself painfully around Kaecilius, contorting his body into a submissive position as it locks itself there. It is arguably the gnarliest effect in the whole movie, and one that audiences seem to get a big kick out of – it is both fantastical and everyday, archaic and futuristic. If this is an indication of what kind of story beats future Doctor Stranges are capable of providing, we’re definitely in for the long haul. Dr. Strange’s grabbing of the Eye of Agamotto, an extraordinarily powerful magical relic, in Kamar-Taj’s library is one of the most important moments in the entire film. By putting it on and activating it – something which even most of the masters there cannot, apparently, accomplish – Stephen demonstrates the vast reservoir of untapped potential that resides within him (and also unleashes one of the coolest-looking spell effects in Strange, which is no small feat). He also introduces into the Marvel Cinematic Universe for the very first time something which rumor has already indicated may play a very large role in both The Avengers: Infinity War and the beginning of Phase IV, in the summer 2019: time travel. Using a partially-eaten apple as the example for how time-control magic can work is ingenious, especially when Strange fast-forwards it to a decomposed state. Mordo and Wong’s horrified-yet-still-awed reaction is also sublime, helping to set up the film’s climax while simultaneously explaining why not everyone is flitting all about the timeline, making changes left and right. In order to adequately explain this whole new sub-mythology within the larger MCU – parallel dimensions, alternate realities, astral planes, the fluid flow of time – director Scott Derrickson needed to convey reams and reams of exposition. He also needed to establish the new look of this new take on the Marvel Cinematic Universe, and how the visual rules of magic work, and make the viewer suspend his disbelief just enough to fully be on board for Strange’s duration. The answer? An introductory sequence in which the titular doctor goes on a trip through the far recesses of the multiverse, keeping audiences engaged while simultaneously conveying all the necessary backstory. (It doesn’t hurt that last year’s Ant-Man helped in this regard, setting the stage for Doctor Strange’s full-throated theatrics.) The 2001: A Space Odyssey-esque journey is a mission statement, a promise to viewers, and a thoroughly fun way to spend five minutes in a film, all rolled into one. Ever since Christopher Nolan established the practice with both The Dark Knight and The Dark Knight Rises, a number of modern Hollywood movies – particularly the comic-book sub-genre – have felt it necessary to include a prologue that sets the stage for the following film’s action, tone, and plot. Doctor Strange doesn’t disappoint in this regard at all. The audience’s first encounter with the world-altering battling of the masters of the mystical arts is mind-blowing and jaw-dropping in equal measure; when one adds the kung-fu fisticuffs of the Ancient One and Kaecilius’s followers and the eye-popping effects of their magical weapons, the sequence becomes more than over the top. And the fact that audiences enter this cold, not having any sort of explanation or build-up at all, only adds to the spectacle. Put more simply: Strange starts perfectly. That it also happens to end the same way makes it one of the most satisfying single-viewing experiences in the Marvel Cinematic Universe to date. The Ancient One is dead. The London Sanctum Sanctorum has fallen. The New York holdfast has been broken, and now Stephen Strange and Karl Mordo must hurry to the Hong Kong Sanctum as fast as possible to prevent the dread Dormammu from consuming the entire Earth. Except when they arrive, they find a scene of mass carnage, including scores of dead civilians – and Wong, who died valiantly off-screen – and a sky that is increasingly becoming consumed by the Dark Dimension. The stakes really couldn’t be raised any higher. It’s the most unbelievable way to start off the story’s climactic end-battle, and it provides some of the best imagery (and visual effects work!) in the entire film. And even if audiences are able to piece together that Dr. Strange will employ the Eye of Agamotto to engage in some more time travel right before the character pulls out the magical artifact to do so, the suspense over him breaking the laws of nature in this way aren’t diminished in the slightest; the movie has so effectively set up the dangers of playing with the space-time continuum, viewers can be more than forgiven if they think such a move will have dire consequences, if not backfire completely. What more could you ask for in setting up the climax? One thing, actually: a worthy follow-up conflict, one that is able to take the absolutely stellar setup and translate it into a kinetic, engaging, well-crafted conclusion. Luckily for us, Doctor Strange is able to deliver on this, as well. As Stephen starts to rewind time in all of Hong Kong, audiences are treated to the visual delight of seeing an entire city start to piece itself back together; bodies fling back through windshields into cars, bystanders take food out of their mouths and put it back into their bowls, and Wong lurches out of the rubble to his feet. And then, when Kaecilius and company are able to pry themselves out of the rewind spell, they take the fight to the heroes once more, forcing each other to duck around all the flying debris – culminating in the way-too-cool image of Kaecilius himself being sealed in a brick wall as it just so happens to rebuild itself while he gets thrown there. There is just no conceivable way that Doctor Strange didn’t take full advantage of its time manipulation abilities in this sequence. The final confrontation between good and evil, life and death, normal-space and the Dark Dimension is just as fittingly crafted as everything that had preceded it. Dormammu’s home is complementary to the rest of the cosmic sequences depicted, yet different enough to make it both beautiful and haunting, irresistible and off-putting. And the Lord of the Realm of Darkness’s design is suitably other-worldly while still being relatable as an emoting character that an actor could portray – a suitable pay-off to a movie-long build-up of this mysterious being composed of mystical energies. All of this, however, is literally just set dressing to the main action: the showdown between Strange and Dormammu, in which the future Sorcerer Supreme activates a time loop that allows him to keep coming back again and again after being murdered innumerable times – and in innumerable ways – by his foe. Indeed, this montage of rapid-fire deaths and reintroductions plays almost comedically, like a twisted scene from Groundhog Day. This combination of surreal design, emotional tension, and humor is a sublime ending – one of Marvel’s best to date. Did we miss your favorite scene? Disagree with our top three picks? Be sure to sound off in the comments. Doctor Strange is now playing in theaters; Guardians of the Galaxy, Vol. 2 opens on May 5, 2017; Spider-Man: Homecoming– July 7, 2017; Thor: Ragnarok – November 3, 2017; Black Panther – February 16, 2018; Avengers: Infinity War – May 4, 2018; Ant-Man and the Wasp – July 6, 2018; Captain Marvel– March 8, 2019; Avengers 4 – May 3, 2019; and as-yet untitled Marvel movies on July 12, 2019, and on May 1, July 10, and November 6 in 2020.